So what is it? 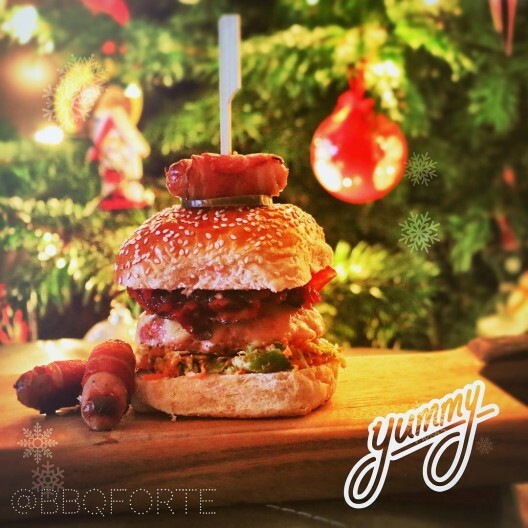 It’s a Turkey & Smokey Bacon Burger, Brussel Sprout Slaw, Oak Smoked Cheddar, Pancetta Weave, Cranberry Sauce and topped with a pickle and pigs in blankets. Make your burgers by combining all the burger ingredients together then shape them into burgers using yours hand or a burger press. Finely grate the sprouts and carrots then combine in a bowl and add the vinegar and South Carolina BBQ Sauce. Now you need to create some bacon weaves. For mine I use 4 rashers of pancetta cut in half and stretched out for each weave. This makes them the perfect size for the burger. Now smoke your burgers in your BBQ at around 225F until they reach an internal temp of 165F. Put your bacon weaves onto some foil and put them in the BBQ until they are nice and crispy and cook your pigs in blankets. Then bring off the burgers and put them onto a hot skillet and cook for a few minutes each side, then add your cheese to the top and cover with a closh for about 1 minute to melt the cheese. Time to build the burger. Layout the base of the bun. Finally push a wooden skewer through the pig in blanket and through a pickle and then straight through the burger.